This dairy & soy-free formula provides 10 billion CFU of the beneficial bacteria Lactobacillus acidophilus, Lactobacillus rhamnosus, Bifidobacterium longum, Bifidobacterium bifidum and Bifidobacterium lactis. 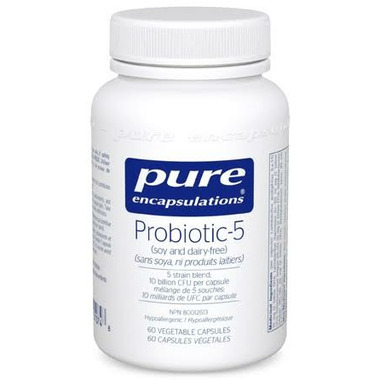 This formula combines lactobacilli and bifidobacteria to promote gastrointestinal (GI) tract health and comfort, immune cell function and overall health. G.I. Health and Comfort: L. acidophilus and B. longum have been shown to promote healthy cytokine production in the colon and maintain healthy GI barrier function, in part by supporting the mucosal lining of the GI tract. Immune Cell Function: Studies suggest that probiotics support immune health, enhancing B cell, T cell and NK cell function. Good product. I'm taking it as part of s naturopath program and it's helping me. I woul definitely suggest this product. Seems to work well with me. 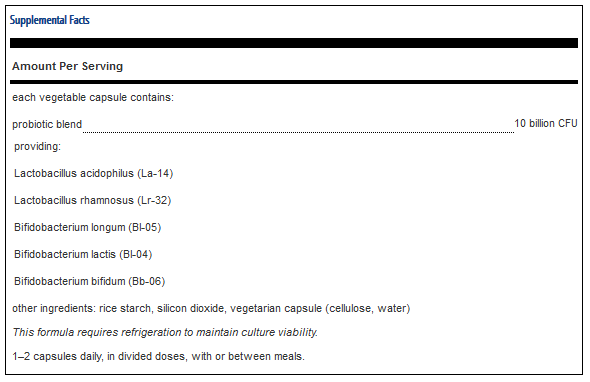 Have been taking on alternating days with other probiotic capsule during bad diarrhea days to replenish larger variety.